Renew your appreciation for the breathtaking beauty that surrounds us in life's simplest details. 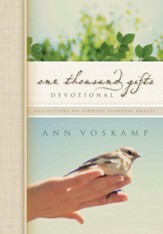 Encouraging you to ruminate even deeper on the concepts explored in her best-selling book One Thousand Gifts, Voskamp offers 100 wisdom-soaked devotions, complete with Scripture verses, prayers, reflection questions, and space to record your own insights. 208 pages, hardcover from Zondervan. 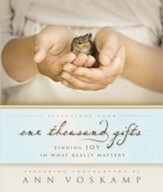 Following the New York Times Bestseller, One Thousand Gifts -- a guide to giving thanks and finding joy in all aspects of life -- Ann Voskamp returns with this companion One Thousand Gifts Devotional. How in the world do we find real joy and experience grace in the midst of deadlines, debt, drama, and all these daily duties? 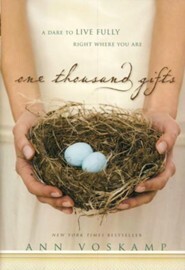 Pick up a pen and this book -- and change your life. Take the dare to fully live! 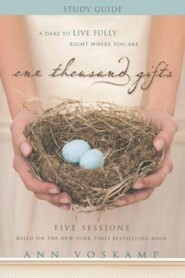 I'm the author/artist and I want to review One Thousand Gifts Devotional.